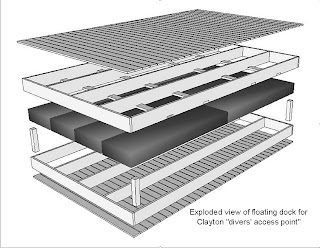 Clayton Diving Club: Work party for Clayton "divers' access point" Saturday Apr 27th 9AM at French Creek Marina! Work party for Clayton "divers' access point" Saturday Apr 27th 9AM at French Creek Marina! This is the assembly stage for the main floating dock of the Clayton "divers' access point" It will be assembled in French Creek Marina, Clayton NY. At a later date after construction, it will be floated out to the site and secured in place.